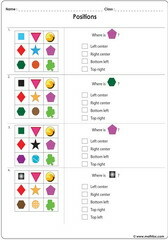 Spatial sense activities for children, location in left, right, middle, top, bottom, center, center right, center left, top left, top right, bottom left, bottom right, inside, outside, on top, under. 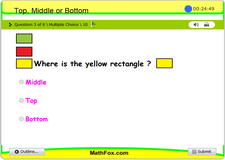 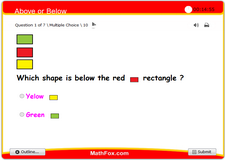 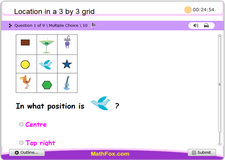 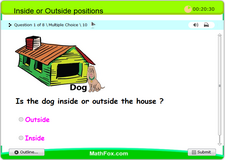 Spatial sense math worksheets, games, quizzes, tests, PowerPoint games, board games, card games etc . 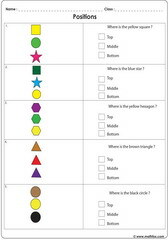 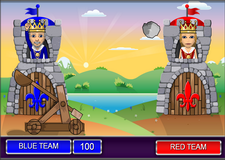 Suitable spatial sense exercises for children in the following grades : Pre-K, Kindergarten, 2nd grade, 3rd grade. 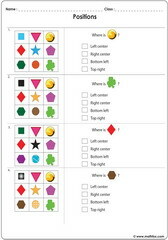 Resources cover the following spatial sense and positions topics: location in left, right, middle, top, bottom, center, center right, center left, top left, top right, bottom left, bottom right, inside, outside, on top, under etc.